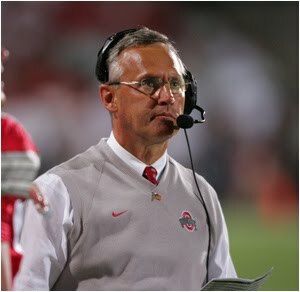 Ohio State University football coach Jim Tressel has been suspended for the first two games of the 2011 season and fined for withholding information related to his players' involvement with a memorabilia scheme with a Columbus businessman. Yahoo! Sports reported Monday that Tressel had received information that quarterback Terrelle Pryor and other players were selling items to Edward Rife – the owner of Fine Line Ink Tattoos in Columbus – as early as April 2010. Tressel admitted Tuesday that he had indeed withheld information about his players’ involvement in the scheme – something the university discovered on Jan. 13 when reviewing files for an unrelated matter. Tressel’s suspension and fine account for Ohio State’s self-imposed sanctions for the coach’s ethical conduct violation. He will also receive a public reprimand and must make a public apology. However, the NCAA’s Committee on Infractions could choose to stiffen those penalties with a more lengthy suspension or other potential sanctions. The NCAA is still considering the appeal of the five players involved in the memorabilia dealings with Rife. After the Buckeyes self-reported the scheme in December – without the knowledge of Tressel’s omission – the NCAA suspended the players for the first five games of the 2011 season, including Pryor, running back Dan Herron, wideout DeVier Posey, defensive end Solomon Thomas and offensive lineman Mike Adams. The players also had to repay the improper benefits gained – $2,500 for Pryor, $1,505 for Thomas, $1,250 for Posey, $1,150 for Herron and $1,000 for Adams. All were cited for receiving discounted tattoos, including Linebacker Jordan Whiting having to pay $150 to a charity. Both Smith and Gee said Tressel’s withholding of information never placed his job in jeopardy.